In interviews, director Robert Rodriguez and co-producer (with James Cameron) Jon Landau took great pains to distance “Alita” from 2017’s “Ghost in the Shell,” the $110 million film that flopped with only $170 million in worldwide receipts and was also accused of white-washing its Japanese source material by casting mostly non-Asian actors in its live-action version. 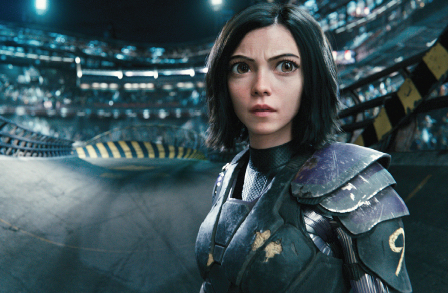 Rodriguez claimed that “Alita’s” original source material was set in Kansas and the characters weren’t even Japanese or Asian to begin with. Yet Alita was discovered by Dr. Daisuke Ido (in the film, he’s renamed Dyson Ido and played by Christoph Waltz). Alita’s first battle was with a cyborg named Makaku. Other characters included Koyomi K. (played in the movie by Asian American Lara Condor), Jashugan and his sister Shumira. ZOTT fighters and crew included characters named Toji and Ping Wu. “In ‘Alita,’ were most of these Asian names changed to accommodate non-Asian actors?” asks MANAA Founding President Guy Aoki. “There are more similarities to ‘Ghost in the Shell’ than ‘Alita’s’ filmmakers want to admit: Alita and Major Mira Killian are both cyborgs with super strength and agility, who use high-tech weaponry but have amnesia about their past lives. Because the 26th-century cyborg didn’t know her true identity, Dr. Ido named her Alita after his cat, but we eventually learn her real name is Yoko, just as in ‘Ghost in the Shell,’ The Major realizes she was originally Motoko Kusanagi. “Obviously, it made more sense for both characters to be played by Japanese or Asian actresses. Especially since Asian/Asian Americans are rarely allowed the opportunity to play starring roles in Hollywood motion pictures. For the last few years, even when material is adapted from Asian sources, the roles go to non-Asians, with ever-evolving excuses as to why. Tellingly, Vector, a black character, remains black and is played by Mahershala Ali. Apparently, the producers were more concerned about white-washing a black role than the Asian roles, according to MANAA. “I said it when ‘Ghost in the Shell’ was released, I’ll say it again: ‘Apparently, in Hollywood, Japanese people can’t play Japanese people anymore,’ quips MANAA President Robert Chan. “There’s no reason why at least Alita and Dr. Ido couldn’t have been portrayed by Japanese or Asian actors instead of Rosa Salazar and Christoph Waltz, respectively. Besides Lana Condor and Leonard Wu, were any Asian American actors even considered for the larger parts? The twice-delayed film (originally scheduled for July 20, 2018 then Dec. 21, 2018) will finally be released on Valentine’s Day. Since 1999, as part of the Asian Pacific American Media Coalition, MANAA has met annually with the top four television networks, pushing for more inclusion of Asian Americans. In 2015, it also promoted that vision with talent agencies ICM Partners, WME, Paradigm, and CAA.